When a carrier concentration gradient exists in the semiconductor, through random motion, carriers will have a net movement from areas of high carrier concentration to areas of low concentration in the process of diffusion. With time, these carriers will diffuse throughout the cell until the concentration is uniform. The constant random motion of carriers can lead to a net movement of carriers if one particular region has a higher concentration of carriers than another region (a concentration gradient between the high carrier-concentration region and the low carrier-concentration region). The net movement of carriers is therefore from areas of high concentration to low. If we let random movement do it's thing, over time, the carriers will become evenly spread across the space through random motion alone. This can be seen in the animation below. The rate at which diffusion occurs depends on the velocity at which carriers move and on the distance between scattering events. It is termed diffusivity and measured in cm2s-1. Values for silicon, the most used semiconductor material for solar cells, are given in the appendix. Since raising the temperature will increase the thermal velocity of the carriers, diffusion occurs faster at higher temperatures. 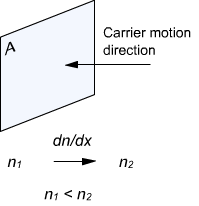 A single particle in a box will eventually be found at any random location in the box. One major effect of diffusion is that, with time, it evens out the carrier concentrations in a device, such as those induced by generation and recombination, without an external force being applied to the device. This is shown in the animation below in which one region of the device has a high concentration of electrons and the other has a high concentration of holes. Due purely to the random movement of carriers, the two concentrations will become uniform throughout the material, over time. The holes (blue) and the electrons (red) move from areas of high concentration to low concentration w/in a semiconductor towards an even distribution. The holes (colored blue) have a lower diffusivity than the electrons (colored red), and so take longer to fill the full space. It is known from the molecular physics that the flux of diffusing particles is proportional to the concentration gradient. With time (t1, t2, t3), an initial pulse of electrons will diffuse. Spreading of a pulse of electrons by diffusion. Arbitrary part of n(x) is divided into the segments of length equal to a mean free path for the electrons. Concentration is supposed to be constant for every segment. Consider small segments of width l to the left and right of x0 and approximate the electron concentrations n1 and n2 in these segments as uniform. The difference in electron concentration between the two points (n1 and n2) needs to be written in terms that we understand. We can define both n1 and n2 using an excerpt of the above graph. In order to approximate the electron concentration as x changes, assume that x is very small. *this derivation can also be used for holes! Dn is the electron diffusion coefficient with units cm2/s. The minus sign arises from the fact that the vector of the concentration gradient is directed toward the increase of the concentration, while the particles diffuse to the area with lower concentration. formula for the carrier flux density should have a minus sign. Continuity equations give the rate of carriers buildup in the bulk of semiconductor. where U is carrier recombination rate, G - generation rate. Currents entering and leaving a volume AΔx. Consider the length dx of semiconductor and movement of holes through it. The net increase in hole concentration per unit time is the difference between the flux of holes entering and leaving the volume AΔx plus generation rate and minus recombination rate.